With Valentine’s Day around the corner, it’s time to feel your best and what could be sexier than restoring the beautiful V-shape face of your youth? The young face is accentuated by full cheeks, tapering down to a well-defined jawline and chin at the tip. Unfortunately, the aging process tends to reverse that V-shape, as volume is loss from the cheeks and displaced to the lower face resulting in jowls and loss of a contoured jawline. Let Anand Medical Spa help you restore the perfect V-shape for V-day, with nonsurgical solutions designed to sculpt the facial profile. When the midface begins to lose its natural volume, facial hollowing can form that makes you look older and wearier than you feel. Reviving tired cheeks may be as easy as a dermal filler injection, particularly when that filler is an advanced, beautiful formulation like Voluma. The smooth, thick consistency of this filler is just right for adding volume to the cheeks and definition to the cheekbones, whilst lifting your midface to create a more youthful contour. Voluma offers a secondary benefit in your quest to create a beautiful V-shape. This filler can also be placed strategically along the jawline to address early skin laxity and jowl formation. By adding subtle volume to this area, we can smooth and firm the lower face to enhance the definition of the profile. Voluma is a long-lasting dermal filler that offers positive effects for up to two years for many of our patients. There are other ways to address drooping and sagging that cause concern in the lower face as well. When a little lift is in order for the holiday, that’s where a PDO thread lift can come in quite handy. 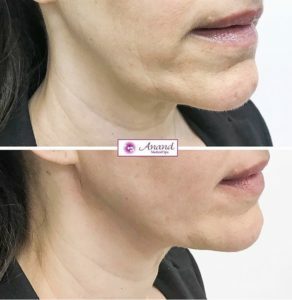 This minimally-invasive procedure uses dissolvable sutures to reposition skin and tissue in the lower face, creating greater definition along the jawline and contributing to the v-shape patients want. At the same time, these threads add immediate support to the dermal structure, they trigger collagen production to accentuate and extend the positive results. While there is some mild swelling after the procedure, downtime is minimal. Another option for firming up the lower face is a nonsurgical treatment known as Ultherapy. This device harnesses the power of Ultrasound technology, which works deep into the dermal structure to produce tightening from within that creates a more attractive outer profile. Ultrasound energy provides gentle heating to the dermal structure, restoring the foundational skin levels and producing a smoother, more beautiful complexion. 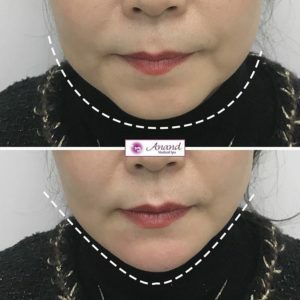 For the jawline, treatment usually last anywhere from 30 to 60 minute depending on if we are treating under the chin as well, and there is no downtime after the procedure. There is one additional procedure that can go to work on the jawline to perfect the V-shape you are craving in this season of romance. Botox injections are typically considered an anti-wrinkle treatment, but the benefits of this medication go much further. 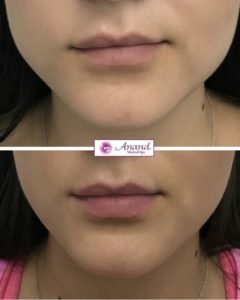 When it is injected into the masseter (jaw) muscle, it also effectively slims the lower face, producing a more streamlined contour down to the chin. Botox injections are performed right in our office in just a few minutes. The procedure is relatively painless and produces full results within days of your treatment. Effects last up to four months for most patients, and you can schedule repeat injections to maintain your refreshed contour. You can add a few injections to your forehead or the outer corners of the eyes to smooth away wrinkles at the same time if you choose. Whether you are planning a hot night of romance on February 14 or looking forward to a movie marathon, you can enjoy your holiday looking and feeling your absolute best. With hearts in style this time of year, now is the time to revamp your facial profile, so it reflects the perfect, youthful V-shape all year around. 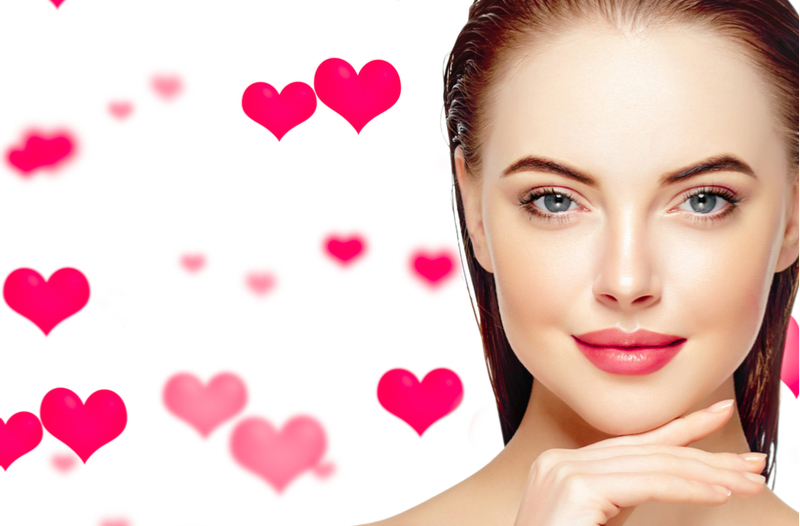 Dr. Chugh and her staff are ready to help you accentuate your beauty this Valentine’s Day with treatments tailored just for you. Contact our office today to schedule your appointment at 212-653-0366.